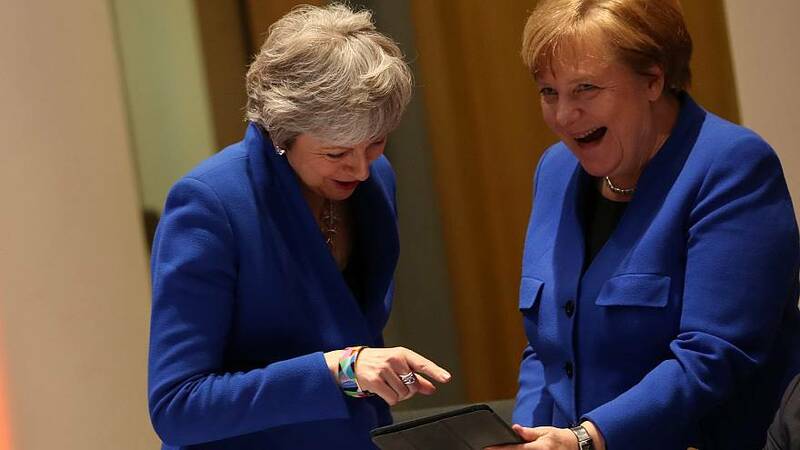 Footage from tonight’s summit of European leaders reveals Merkel showing May a screen and then sharing a laugh with her. It is later passed to Donald Tusk, president of the European Council — which is made up of heads of state from EU countries —, who also laughs. The exchange is likely to be a welcome one for May who has had a couple of tense moments at EU summits. Footage of her standing awkwardly alone as her fellow EU leaders greeted each other warmly at one such event was seen by many as a perfect Brexit metaphor. At another May and European Commission president Jean-Claude Juncker were caught having what appeared to be an intense exchange. Lip readers and Twitter users claimed May was bickering with Juncker after he had called her “nebulous”.